The breech opens by rotating the handle attached to the barrel, which unlocks the interrupted thread and allows the barrel ( and handle) to slide forward forward, after which the ring on top of the breechblock can be used to hinge it up about a pivot at its after end. If it is desired to remove the barrel, with the breech open the barrel is drawn back as far as it will go and rotated clockwise into the position that would lock the breech if it was not open. With the barrel rotated fully clockwise the handle is almost touching the edge of the stock and can now be moved forward until the after end of the barrel clears the breech end brass retaining ring, at which point the barrel can be pivoted up on a hinge visible just at the front of the fore-end and then slid backwards and out of the front brass retaining loop which is the part actually attached to the hinge. Thus the barrel may be removed from the stock. Under the fore-end there are a pair of grooves and a sprung detent that controls the degrees of freedom of the barrel using a lump attached to ( or part of) the barrel. When I acquired this gun it was not possible to move the handle forward enough to release the barrel, but it turned out that the separator in the controlling grooves had been slightly bent – a quick tweak restored it to working order. Note the nice brass handle in front of the trigger guard – the gun balances perfectly at this point – obviously someone thought about the design of this firearm! The mechanism is well made and well thought out – I am strongly tempted to shoot it one day, but given that its a rather rare gun and in very good condition I’m reluctant to add any wear to it! There are a few references to Sartoris in the literature, and although the date and numbers of his patents are known, I’m not sure if any specification still exists – according to the British Library patents up to 1852 ( I think it was) were often not filed fully, and all the records that now exist, including the numbers we now use, were compiled from rather scrappy records in teh mid 19th century. I will go and have a look at what exists one day before my Readers Ticket at the BL expires! 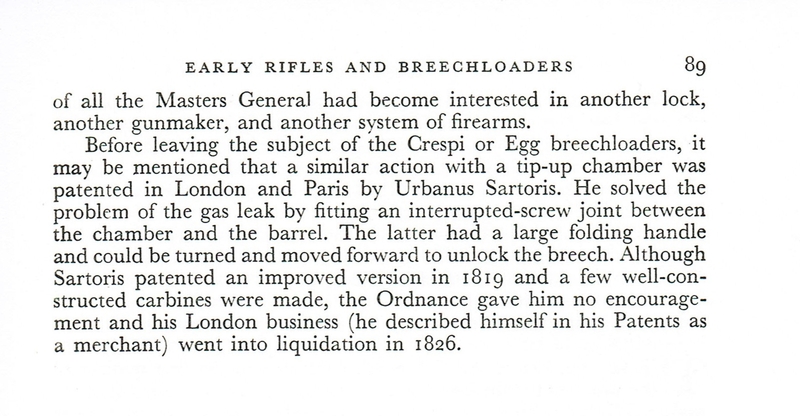 J.N.George in his 1947 book ‘English Guns and Rifles’ also mentions Sartoris at page 180, and was clearly impressed by the improvement that the interrupted thread locking system gave the carbine over the Egg breechloading flintlock – in fact the interrupted thread system used (invented?) by Sartoris went on to become standard on most large calibre artillery. The Sartoris breechloader came at the very end of the flintlock era – the first percussion patent was 1807 and the tubelock was being made by Joseph Manton about the time that Biven was making the Sartoris guns, so although one or more were subsequently converted to percussion, it really missed the boat!